Family Oriented & Affordable Deep Sea Fishing! 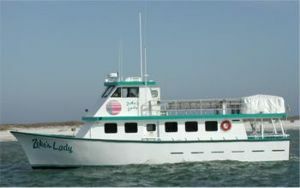 Zeke's Lady is a newly rebuilt 58-foot party boat that is available for daily walk-on trips (4-6 hours), private trips (up to 12 hours) and cruises. The legendary Captain Butch Tucker, with his vast bottom-fishing experience in the Gulf of Mexico, runs the Zeke's Lady. As one of the best in the business, Captain Tucker truly knows every aspect of captaining a charter boat.